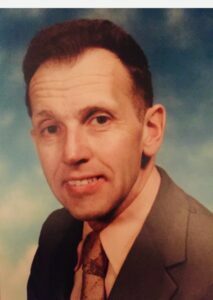 AUBURN - Ray LeRoy Cole, 92, passed away on Feb. 4, 2019, at Clover Manor, in Auburn. AUBURN – Ray LeRoy Cole, 92, passed away on Feb. 4, 2019, at Clover Manor, in Auburn. Ray was born in Port Jervis, N.Y. on Nov 20, 1926, to Raymond and Clara (Smith) Cole. He graduated from Port Jervis High School in 1944 and then worked full-time on the Erie Railroad for four years before going to college. He earned a bachelor’s and master’s degree in education at the state university in Albany, N.Y.
Ray met Joan Marie Carnie while both participated in a thespian society. They married on June 27, 1954 in Belleville, N.J. and lived the next 47 years in Warwick, N.Y. where they raised a family. Ray first worked in public education as a high school history teacher in Florida and Middletown, N.Y. before being hired, at age 31, as superintendent off schools in Greenwood Lake, N.Y., a position he held for 26 years until retirement. Over the years Ray eschewed opportunities for higher pay and professional advancement in order to keep his three children in the same community throughout their youth – something very important to him. In the fall of 1959, Ray and his brother bought a large camp property on Great Pond in Belgrade Lakes, thus starting a long-term familial bond with the state that continues today. Ray and Joan moved to Maine year-round in 2001, living in Bethel, until the ravages of age put them both in a nursing home last year. We remember Ray Cole as a smart guy, full of clever, insightful quips, and as someone who marveled at life’s simple, elegant things. He savored learning and appreciated knowledge – all the while reading a wide variety of materials and literature in its pursuit. Sadly a decade of dementia extinguished this light well ahead of his death. Ray was predeceased by his parents; an older brother Russell (wife Loretta); and a niece Jeanne. He is survived by his wife of 64 years; oldest daughter, Susan Samble (husband Paul) of Springfield, Mass., son, Scott (wife Michele) of Bethel, youngest daughter, Janice Cole of Bristol, Conn.; two grandchildren; and two great-grandchildren. There will be no visiting hours or service.